Heavens to Betsy, it’s been all go here this week. After a little bit of a lull waiting for materials, Monday started with a bang and all hands on deck. Slightly sweaty in the sun reclaimed brick packs were cut open to air and the dial on the cement mixer set to overtime. Sloppy concrete was poured and trainers wrecked. Weighty waiting steels sat ready for their new lifetime employment holding up my walls. Barrows and skips were primed for full on use. In a house with no sinks or baths, the kettle was boiled. Many times. And then it all happened! 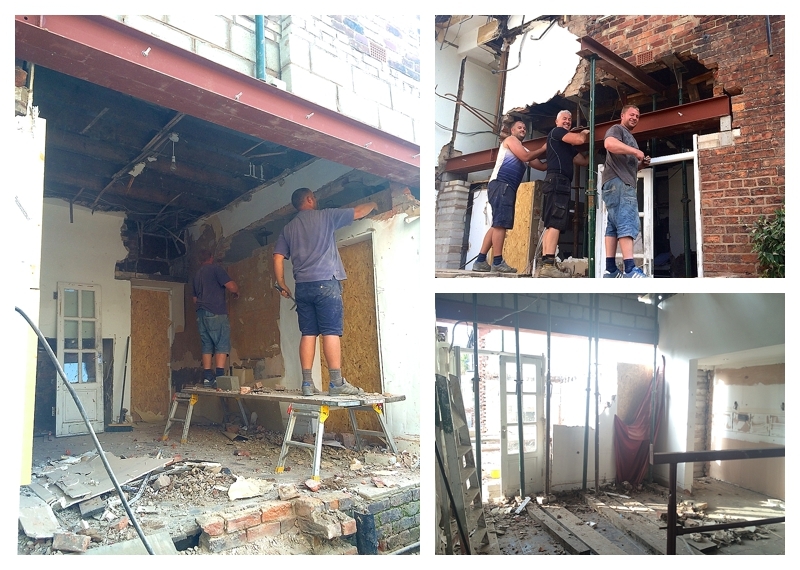 Below you can see the wall to the main part of the house prepped for it’s first knock through, to form the opening from what will be the new dining room into kitchen. 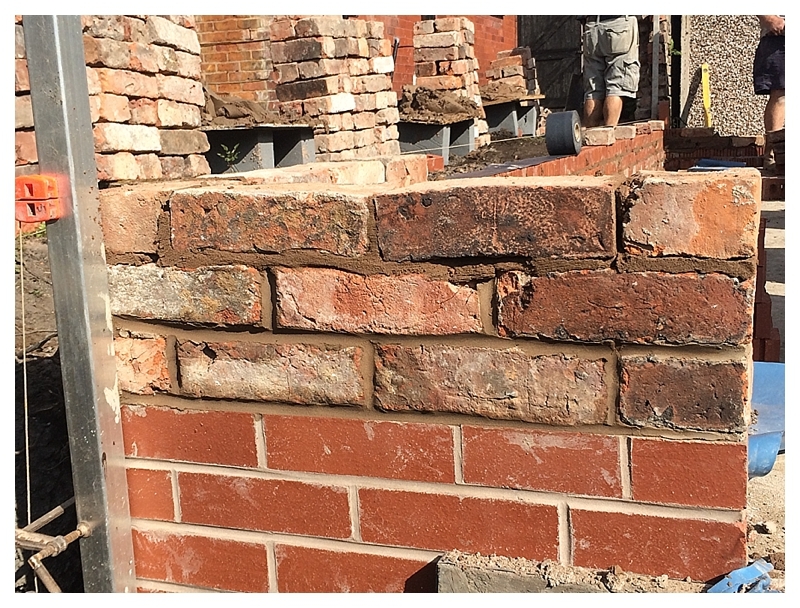 All the brickwork above the new opening must be supported, not easy in an old house where the mortar’s already crumbling and very little is stable at the best of times, never mind when it’s being bashed about. Acrows inside held up the wall existing joists, a hole was made, concrete padstones put in at either end and the two steels, later bolted together, hoisted into place. Took four of them, quite a bit of shouting and some noticeable knee trembling but lo and behold ’twas done in blink of an eye. OK, maybe not the blink of an eye but in pretty rapidly and holding up the brickwork above so everything below could be removed! I’ve never liked those white patio doors, so glad to see the back of them after all these years! You get a sense of the space in this Vine taken after both walls had been dropped, where I’m standing looking across what will be the the new dining room looking towards the living room, then out to where the kitchen will be. It’s quite big isn’t it, said Mr M, paling slightly at the thought of filling it / decorating it / cleaning it….. I can’t wait for it to be finished and to start having events here!! The brushed finish is the central section, as opposed to the rougher more rustic look above. In the meantime keeping on top of all this dust is exhausting, whilst project managing, still running the business and doing the other stuff we do. Despite Buildbase keeping us well stocked on bricks, block and general materials, Mr M is doing an incredible job on non-stop materials runs for the extras which are constantly needed, digging more holes through thick clay, sorting plumbing and mucking in everywhere he’s asked to. You know the hardest part? Not being able to jump in the shower at the end of the day or have a long soak then sit on a sofa and chill, something you just take for granted in ‘normal’ life. Won’t be long though, I keep telling myself, won’t be long…. Someone on the other hand, isn’t in the slightest bit concerned with getting absolutely blinkin filthy with regular cement dust baths and sand showers at every possible opportunity.